The 360° Orbital Horizontal Ladder Playground Component makes developing upper body strength and agility a whole lot more fun. 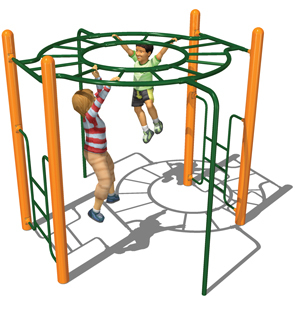 Featuring endless overhead monkey bars that continue in a circle promoting interaction with others. Ladders on both sides mark the start, and the two end poles serve as an easy way down. Adjustable in-ground installation height of 5' - 7'. 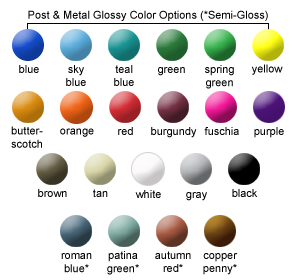 Available in the colors shown. Tamper resistant hardware included. Manufactured for commercial use and tested in accordance with ASTM standards. 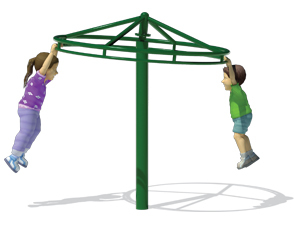 ASTM Use Zone Safe: 20'-4" x 22'-4"
The circular monkey bars play structure is powder-coated with a 5-7 mills thick, triple flo-coated corrosion protection for a superior, high gloss, no peel, no flake finish baked-on at 400°F and resistant to salt spray, humidity, solvents, oils, acids, and alkalies.